The world's last surviving 16th Century warship has been awarded a £21m grant. The overall cost of the project will total £20.5m. Over 19,000 artefacts recovered from the ship will be on display at the museum, which is currently a temporary structure. Admiral John Lippiett, of the Mary Rose Trust, said: "[It] paves the way to complete the long conservation process and display the majority of amazing artefacts in a magnificent museum. "The learning facilities will be world class and able to meet the huge demand placed upon them by school children and students." Dame Liz Forgan, chair of the Heritage Lottery Fund (HLF), said: "The Mary Rose is an amazing time-capsule and one of our most precious heritage icons." The Mary Rose, which sank on 19 July 1545 is the only 16th Century warship in the world to be recovered and put on display. 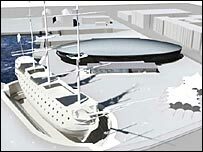 In 2006, the trust's £13.5m Heritage Lottery Fund bid for the major upgrade of the museum failed. More than 60 million people worldwide watched the hull of the ship being brought to the surface in 1982 after 437 years submerged in the Solent. She is estimated to have generated more than £60m since 1982 as one of Portsmouth's major tourist attractions. Meanwhile, the Victorian tea clipper the Cutty Sark, at Greenwich in south-east London, has been awarded £10m from the fund. 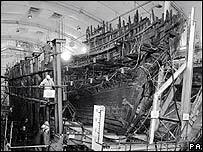 The ship was badly damaged by fire in dry dock part way through a £25m conservation project in May last year.